Ladies, every guy needs some time to unwind in the Mancave! Give him a fun gift that he's sure to appreciate! It's a 6 oz. black stainless steel flask with a no-leak captive screw on lid. 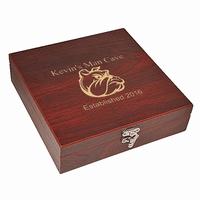 It has a bulldog on the front, an inscription that identifies that it is his Mancave, and the date established that you select. 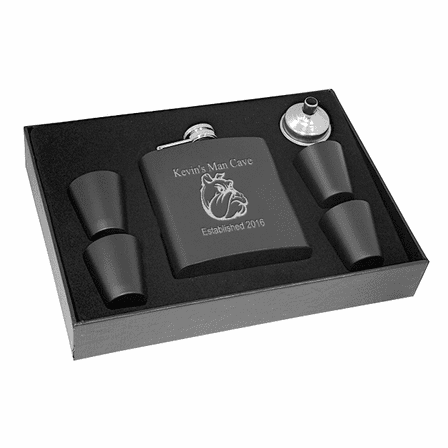 The set includes four shot glasses and a funnel, and comes in a gift box with black foam inserts for all items. 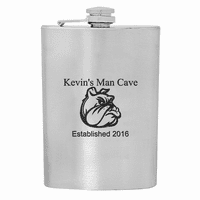 Adding his name and date established is included in the price of this gift idea that's sure to turn him from a grumpy bulldog into a happy puppy! 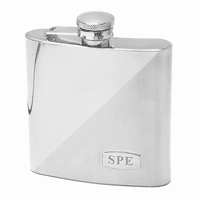 Flask dimensions: 4 1/4" x 3 3/4" 7/8"
Nice gift for best man ushers etc. It has not been given as yet as it is a Christmas gift. ConsThought the shot glasses would be nicer if glass but then in travelling the plastic may prove better see what others think?